Shimla : Senior BJP MP from Himachal Pardesh Shanta Kumar wrote a letter to party chief Amit Shah stating that the Vyapam scam had dented the image of the NDA government and “made all of us bow our heads in shame”. 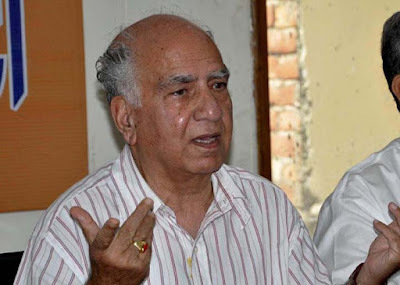 The party veteran also referred to Rajasthan and Maharashtra, without specifically mentioning the controversies surrounding Rajasthan CM Vasundhara Raje or minister Pankaja Munde, and sought the setting up of an ethics committee to act as a “Lokpal” to “keep a check on leaders in the government”. “We came to power with a lot of pride and formed the government at the centre. One year of the government was an year of outstanding achievements. (But) while we were celebrating our achievements… came an eclipse,” Kumar wrote. “From Rajasthan to Maharashtra, people started pointing fingers at us. Reports about Madhya Pradesh’s Vyapam scam made all of us bow our heads in shame… It is very natural for the people to feel highly disappointed and frustrated. The BJP workers are unable to face it,” the letter stated. Copies of the signed two-page letter, written in Hindi and , were posted on the Kangra MP’s Facebook and Twitter accounts. On July 9, the Supreme Court had ordered the CBI to investigate all criminal cases linked to the Vyapam recruitment and admissions scam in Madhya Pradesh, and the deaths of at least 25 accused. Raje has been facing criticism for her family’s commercial ties to former IPL chief Lalit Modi, who is facing charges of financial irregularities. Munde has faced flak in Maharashtra for allegedly awarding government contracts worth crores without following due procedure. Making a strong case for setting up an ethics commitee within the party, Kumar’s letter stated that when the Jan Sangh was formed, the emphasis was on “value-based politics”. “Gradually, we came to power, and became a ruling party… people started making compromises with those values, and here began the politics of power,” the letter stated. However, the former Himachal CM praised Prime Minister Narendra Modi’s Gujarat model of governance, which he said was an important factor for the overwhelming support the party received during the Lok Sabha polls. “This was a historic victory under Narendra Modi because of his image and work in Gujarat,” he wrote.